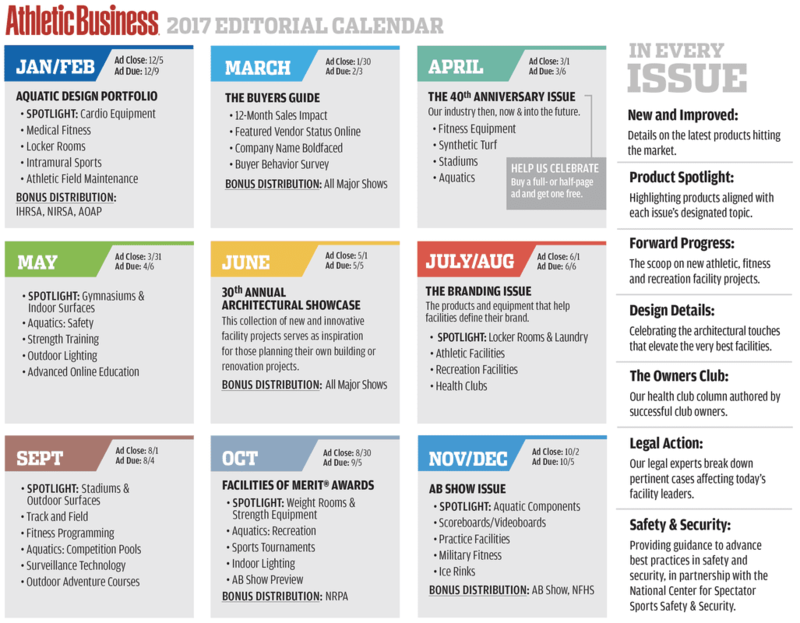 2017 marks the 40th Anniversary of Athletic Business – and we have an awesome editorial lineup in store, including the Aquatic Design Portfolio, the annual Buyers Guide, a special edition issue to celebrate our 40th Anniversary, the 30th annual Architectural Showcase, the Branding Issue, Facilities of Merit Awards and the AB Show Issue. Sent nine times per year, Athletic Business is the destination for your organization to showcase your products and services year-round to our 40,000 qualified magazine subscribers. ​Take a look at what we have in store and secure your advertising space today!